A Tonk's Tail... err, Tale...: Special Edition Waif: Meet Macy! We'd like for you to meet Macy. Macy is a total sweetheart - she loves following humans around, chirping and meowing and carrying on complete conversations. She's so personable and friendly! She's also a bit obese, and is therefore classified as a special needs cat. 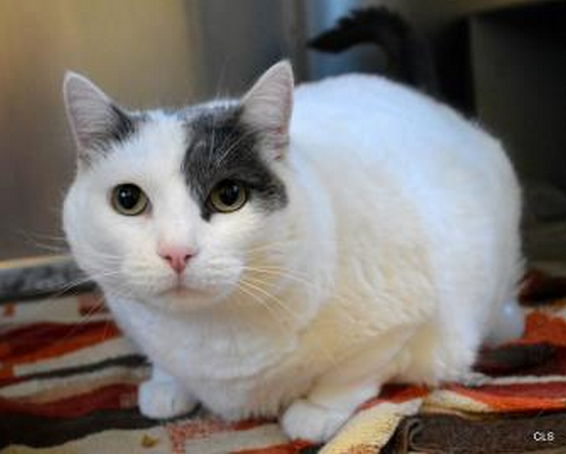 Macy needs someone who can help her shed the pounds, but do so in a way that is healthy for her. Please, won't you share Macy with your friends and followers on Facebook, twitter and Instagram? Let's find this sweet girl a home - a good one! Macy is available for adoption at Wayside Waifs in Kansas City. We're purring for Macy to be adopted by an experienced cat parent who is able to help her shed the pounds without putting her at risk of Hepatic Lipidosis. We trust she is in good hands until she's adopted. Oh Whisppy, that's our concern! She *was* in the hands of an experienced and loving volunteer - and circumstances removed her. We are SO worried about her now. Keep my paws crossed that sweet Macy will find a forever home real soon ! I’ve shared her all over. I only have one friend in KC who isn’t a blogger. I can see if he known someone. CK, thanks so much - you ROCK! My human and I saw about Macy earlier on Facebook - I really hope she finds a home fast! We shared on Facebook, Twitter and Pinterest. Purring and praying for this special little lady. Oh Macy, you are just too cute. We have all our paws crossed that you find a fantastic home. Take care. You darling girl. I could kiss you all over!!! Sweet Macy we so hope things work out for you and you find a forever home and get fit and trim in the process. Good luck. Have a super Saturday. Macy is so pretty! Thank you for sharing about her. We will, too!